No sooner had president Trump landed in France for a weekend visit to Paris, than he immediate unloaded on his French host, Emmanuel Macron, for proposing to create a "real European army" independent from Washington. Trump sent out a tweet, calling Macron’s proposal “very insulting” just after the president’s plane landed Friday evening for celebrations with world leaders commemorating the 100th anniversary of the end of World War I. “We can’t defend Europe if we don’t have a real European army,” Macron said. “We must have a Europe that can defend itself more, without just relying on the U.S."
Trump's response: first Europe should pay its "fair share" of NATO before it plans on building out its own army. Trump has repeatedly demanded that NATO countries spend more on their own defense and has questioned whether the U.S. should remain in the alliance. Macron and German Chancellor Angela Merkel have both publicly questioned whether Europe can depend on the U.S. to come to its aid in the event of war. 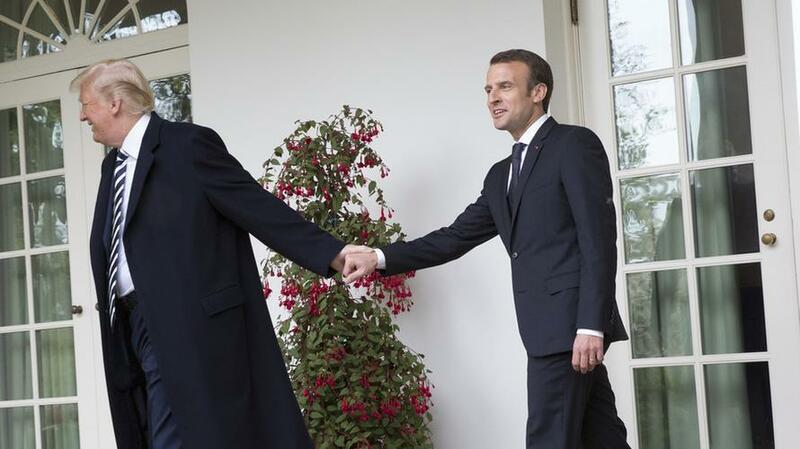 The relationship between Trump and Macron, once described as a "bromance", has since soured after Trump pulled out of the Paris treaty, with the US imposing steep tariffs on EU imports and threatening European businesses with secondary sanctions for dealing with Iran. Trump is scheduled to meet with Macron on Saturday. Most of the rest of Trump’s trip will be devoted to events marking the World War I anniversary, including an Armistice Day ceremony at the Arc de Triomphe and a luncheon for leaders at the Élysée Palace. While we expect a chilly handshake this time between the two world leaders, all eyes will be on the meeting between Trump and Putin. Trump will see the Russian leader for the first time since their summit earlier this year in Helsinki, though White House officials downplayed the encounter, saying Trump doesn’t plan extensive talks with Putin over a weekend that mostly will be devoted to ceremonies.